Foxglove (Digitalis purpurea) - All that you experience is for learning. Inoculate the seed of the Higher Heart by practicing forgiveness. Then, jumpstart the Higher Heart through connecting with the primordial unconditional fire of Love, fire of Creation. I AM activation of the Higher Heart through forgiveness and unconditional Love. Foxglove is native to Europe and easily grows throughout most of North America. It is a pioneer species that helps to hold the soil after an area has been disturbed. Foxglove is very poisonous. However, when used properly it can be an effective medicine. The heart medicine digitalis is made from foxglove. Use Foxglove Flower Essence when you forget that life is for learning and you cut yourself off from Universal Unconditional Love. Foxglove is excellent when you want to expand your Higher Heart chakra (between the heart and throat chakras just below the collar bones). 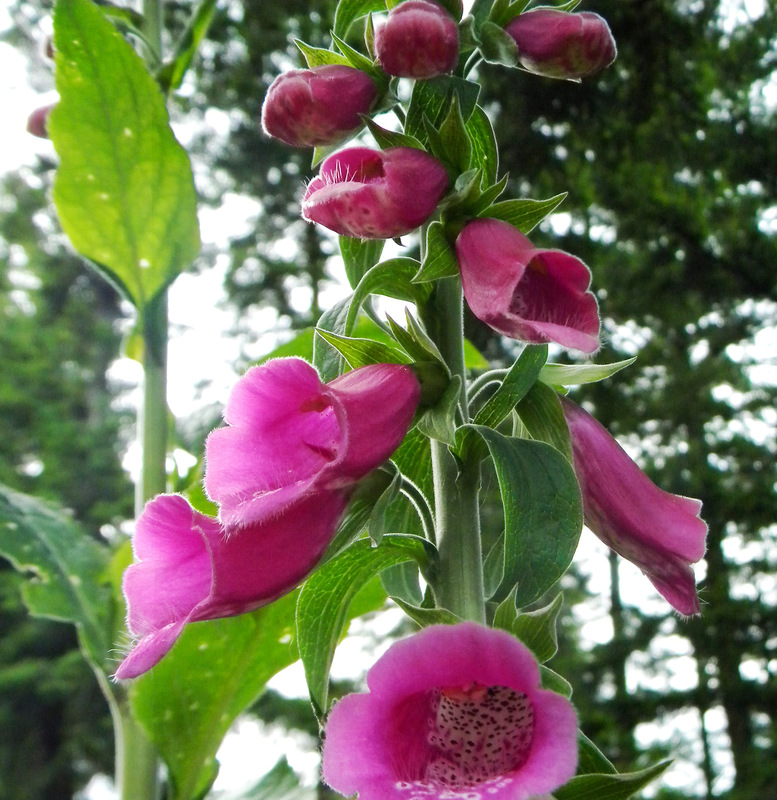 Foxglove Flower Essence is one of the more advanced heart essences. If you are new to flower essences, you may want to work with Lady’s Mantle first. If you know that you have physical heart problems, take only one drop (not dropperful) one time per day to test how you respond to the essence. As humans evolve, a new chakra is developing to bring in Higher Heart energies that connect us to Unconditional Love and the primordial fires of Love and Creation. The Higher Heart chakra also connects us to the knowing that all experiences are for our soul’s learning and engenders forgiveness. The Foxglove Flower Essence was made by the no-pick method of working directly with the plant spirit. The flowers did not touch the fluid in the mother bottles, which there is no possible toxic affect. While the essence was being made a matrix of amber, icosahedron quartz, rhodonite, rose quartz and drusy quartz crystals were placed among the trees with the mother bottles. The sun acts as a transformer to step down spiritual energies from higher dimensions. While the essence was being made, Amber acted as a lens to receive and focus sunlight for this purpose. Icosahedron cut quartz has 20 (5X4) equilateral sides. It is a bridge between the 5th Dimension - the entry into the unified Spiritual realms - and the 4 cardinal directions (N, S, E, W) on Earth. Rhodonite carries the qualities of love, compassion, and generosity. It supports you to recognize and clarify your gifts, and to use them for the highest good in service to others and our Mother Earth. Rose Quartz encourages gentleness, emotional healing, and uniting with the Divine; it shifts your body from a stress-based physiology to a higher frequency Love-based physiology. Drusy quartz crystals help to energize and stabilize your subtle bodies. The actions of the crystals inform the way this flower essence seats into the body/mind.